Principals and school leaders know from experience and common sense what research confirms: Showing up for class matters. Students can’t benefit from investments in high quality instruction and more engaging, rigorous curriculum unless they are in their classroom. As early as the first month of school, chronic absence (missing 10 percent or more of school days) can be an early warning sign of academic trouble, whether a student is in kindergarten or high school. Children who miss too much school in kindergarten and first grade often struggle to read proficiently by the end of third grade. By sixth grade it becomes a key predictor that a student will drop out of high school, research shows. While everyone can help ensure students show up to class every day, the leadership role that a principal plays is irreplaceable. Principals are uniquely positioned to ensure their school adopts a comprehensive, tiered approach to improving attendance (see graphic) that fits with their overall approach to promoting academic achievement. 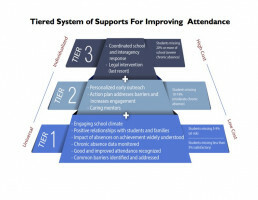 Such a tiered approach is easily incorporated into existing reforms, such as Response to Intervention or Positive Behavior Intervention and Supports, that can be expanded to include specific attention to chronic absence data and supports to cultivate good attendance. Click on each of the links above to find the templates, tools and messaging you need to improve attendance in your school. Keep in mind the importance of tailoring these approaches to take advantage of policies and practices in your own state. As a manager, you know your staff’s capabilities. And as a principal, you know the community you serve and its unique challenges, whether it’s a remote rural locale or an urban setting. We hope you will use your knowledge plus these resources to tailor a plan for reducing chronic absence that suits your school’s strengths and adds to your capacity to respond proactively to chronic absence. 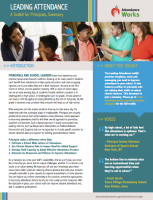 You can inspire your school community to find positive, preventive approaches to improving attendance before turning to more costly punitive measures. With the right plan in place, your school team can improve student attendance and, with it, academic achievement. Read Parents and Schools: Put an End to Chronic Absence, published in December 2014 by the National Association of Elementary School Principals. Join our newsletter for tips, resources and news. Attendance Works is a national and state initiative that pushes for better policy and practice to improve school attendance.